Joyce Stranger was the pen name of Joyce Muriel Wilson. She was brought up in an area she described as on "the borderline between town and country," with "so many birds it was impossible to sleep through the dawn chorus." Her family spent holidays in the British countryside, where she avidly watched wildlife. She began writing about animals and published her first article in 1949. 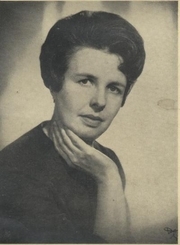 Her first book, The Running Foxes (1965), was a great success, and was followed by her first horse title, Breed of Giants (1967). Over the years, she published some 70 books, including two children’s pony books and eight horse stories aimed at adults. She also wrote Stranger than Fiction, a fictionalized account of the life of Elspeth Bryce Smith, a Welsh girl paralyzed by polio who eventually recovered enough to ride as a jockey, disguised as a man. In her later years, she worked as a dog behavioralist and trainer for obedience shows. Joyce Stranger is currently considered a "single author." If one or more works are by a distinct, homonymous authors, go ahead and split the author. Joyce Stranger is composed of 2 names. You can examine and separate out names.